No matter how hectic your day is – the reliable Toshiba technology incorporated in this A3 system ensures hassle-free handling and intuitive usage when you need it most. Based on sophisticated technology the e-STUDIO 2803am easily integrate into networks and is intuitve to use. Designed to meet the highest environmental standards, this model helps save valuable resources. With an output speed of 23 and 28 pages per minute the e-STUDIO 2303am/ 2803am can easily keep up with the needs of today’s businesses. Their outstanding image quality will give your documents a professional look and leave a lasting impression with your business partners. For you to benefit from the sophisticated technology the systems are based on, we have ensured they are easy and intuitive to use. • Easy integration into existing networks – With the optional e-BRIDGE Fleet Managemet System not only the set-up of the models is easy, even the administration is intuitive and will save valuable time. • Intuitive usage of all functions – Complex as the functionality is, it is nevertheless easy to use. No matter whether you want to print, scan or copy – via the user interface all features are just a click away. 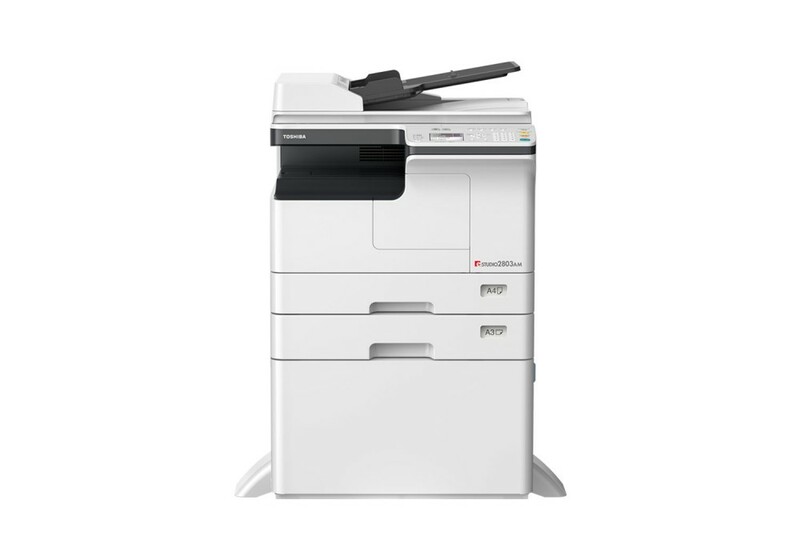 1 Compact A3 systems with print, colour scan and copy function to cover the most relevant requirements. 2 Easy to integrate and operate for utmost efficiency. 3 Excellent image quality for documents which impress. 4 Energy save modes for optimised usage and intelligent resource management.